Laura Hubel/Boulder City Review Catcher Joey Camps throws off his mask as he catches the throw from the outfield in an attempt to make the tag out at home in the July 8 Little League all-star game. Laura Hubel/Boulder City Review Chase Kovacevich steals home after getting on base by being hit by a wild pitch during the Boulder City Little League 9 and 10 year old's all-star game against Moapa on July 9. The 2015 Boulder City All-Star Little League team of 11 and 12 year-olds dropped two of three games last week despite a valiant effort from pitcher Blaze Trumble. Things got off to a rocky start for Boulder City when it lost its first game of the tournament to Central Little League 20-0 on July 1 at the Arroyo Grande Sports Complex in Henderson. The Boulder City All Stars were stymied from the get-go as Central Little League jumped on them early after a two-run double by Trevor Johnson in the first. Central would go on to add seven more in the second inning to put the game out of reach. 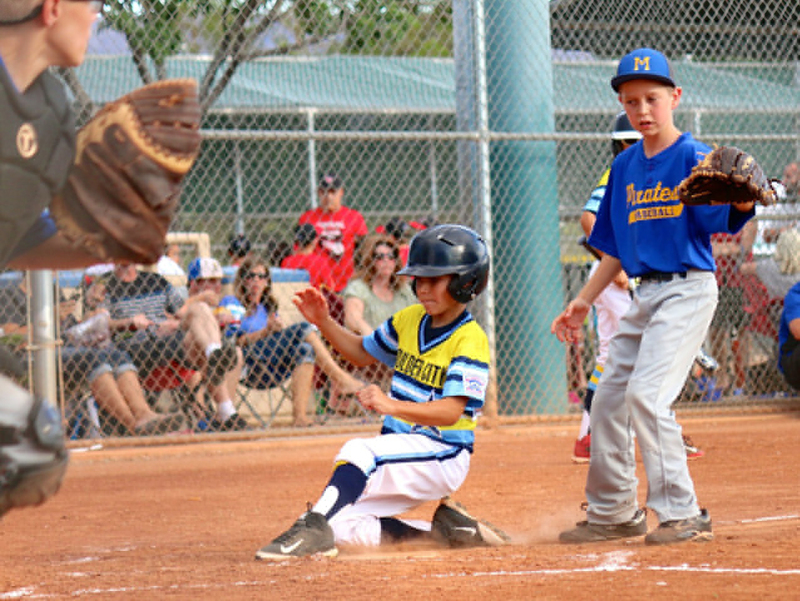 Boulder City, which only managed three hits against Central, recovered nicely during the second game of the tournament by defeating Henderson Little League 9-5 on Friday. With the score tied at five in the sixth inning, Trumble hit a three-run homer to help give Boulder City the victory. The win gave Boulder City a bit of redemption after being shutout in its first game. Trumble finished the game with three hits and four RBIs, including his sixth-inning jack to give Boulder City the win. However, a win over Henderson Little League was not enough to propel the All Stars to a win against Legacy Little League on Monday, despite a home run by Boulder City’s Joey Giunta. Trumble’s dominance at the plate against Henderson translated to success on the mound against Legacy after Boulder City was roughed up in the first two innings. The young hurler allowed just two hits and struck out three in 3 1/3 innings of work, but the damage had already been done. Legacy scored six runs by the third inning, and a late push by the Boulder City All Stars in the bottom of the sixth wasn’t enough as they dropped the final contest 6-4. A solo homer by Giunta followed by an RBI double from Ian Mills, and an RBI single by Justin Bonar had Boulder City within striking distance of Legacy, but the comeback fell short after Adam Leavitt grounded out to third base for the final out. Trumble’s .778 batting average for the tournament was high for Boulder City. Julian Estorga and Mills followed suit with .500. Boulder City’s younger All Star team, consisting of 9 and 10 year-olds, went 2-2 in their tournament at the Arroyo Grande Sports Complex. The team dropped its first game 10-9 to Silverado East on July 7 but came back with a 29-7 drubbing of Moapa on July 9. 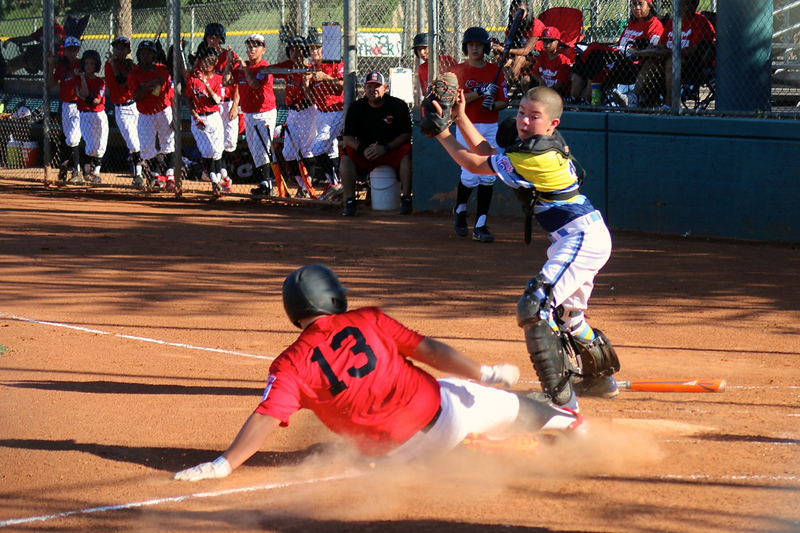 Boulder City followed suit with a 13-10 win over Henderson-Columbia Little League on Saturday, but lost its final game 28-9 to Paseo Verde-Green Little League on Monday. Izec Easter led all Boulder City All Stars with a .714 batting average and 10 runs scored. Brayden Cook finished with a .600 average and scored 10 runs, including the first home run of his young career during the loss to Silverado East. Dodger Smith’s .500 batting average for the tournament was third on the team, though he also tied a team high with 10 runs scored. Smith also took the bump against Henderson-Columbia and finished with five strikeouts and three walks over 4 2/3 innings. Brody Davis, who finished the tournament with a .385 batting average, led the team with eight strikeouts in his closing role. Contact reporter Steven Slivka at sslivka@bouldercityreview.com or at 702-586-9401. Follow @StevenSlivka on Twitter.